EXILED FORMER MINISTER/ ZANU PF POLITBURO MEMBER JONATHAN MOYO; calls for sanctions after rubbishing claims by Foreign affairs minister Sibusiso Moyo that lives were lost on 1 August 2018 due to MDC Alliance violence. 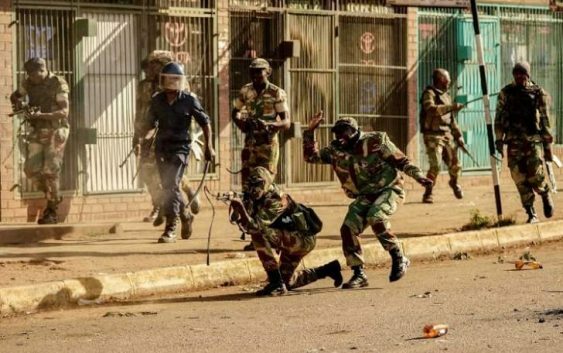 Moyo claims i that the killings were committed after heartless Mnangagwa Zanu pf regime, deployed soldiers to shoot people resulting in the death of Seven people . ‏ “@MinisterSBMoyo is lying that lives were lost on 1 Aug “AFTER MDC-Alliance supporters turned violent”. Lives were lost AFTER govt sent soldiers with LIVE AMMUNITION to kill civilians. A govt that deploys soldiers to kill civilians DESERVES SANCTIONS,” tweeted Moyo. More news to follow, By Sibusiso Ngwenya.